When consulting—and often when lecturing—I continually get questions regarding travel; “how can I get to sleep so early going east”, “how can I wake up so early going west”, “should I sleep on the plane”, “when should I eat”, “should I eat the airport food”, “should I eat the plane’s food”, “should I bring ‘energy’ bars”? It is no doubt that traveling is hard on our bodies, and believe me, I do more than my fair share of traveling. Packing myself into the confines of a single chair, for hours on end, inside of a long metal tube—full of other people, and recycled air—isn’t my favorite way to spend a day. Add to it those friendly TSA friskings that I get nearly EVERY TIME I fly, the time zone changes, the bad food, and constant assault on my senses, and I think you would have a hard time designing a more unpleasant process that people would pay to do. I have written a lot about sleep hygiene and ways to mitigate the unavoidable symptoms of jet lag. You can find all the information you want on those ideas, throughout this site. However, there is one thing that I would like to cover, that I rarely write about: food. I do quite a bit of counseling, consulting, and advising around food, but I do not consider myself to be a nutritional expert. I have really smart friends and colleagues that fill that role for me. Nonetheless, with the amount of traveling that I do, I do feel qualified to weigh in on travel food. 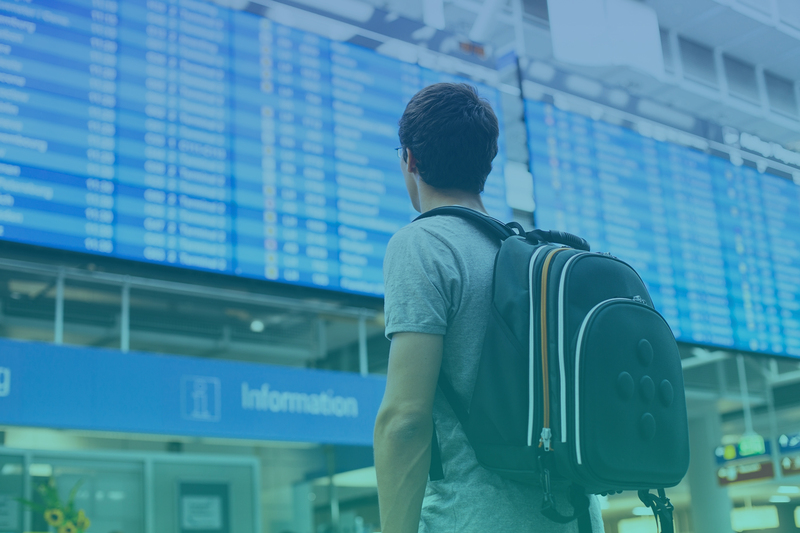 I am sure that there are websites, and apps, and other gadgets that tell you where in the airport you can find the next best thing for you – Organic, Hormone free, Non-GMO, Gluten free, environmentally friendly, energy sustainable, farm to table fair. But, I’m not talking about that. I bow out. What I want to talk about is the food that you can put in your bag, and therefore curl-up in a corner, with your ear buds deep into your ear canals, and avoid as many people interactions as possible. You can do this with various bars–vegan, carnivore and everything in between, high fat, low fat, no fat, hi carb, and low carb. I’m not judging. I don’t have any vested interest in any such product. BUT, you have to go buy those things. You have to find just the right one, the right flavor, that won’t crumble in your bag or melt in your bag. Next, you can put a bunch of different types of nuts in a ziplock bag, and adjust the variety to meet your taste and macro-nutrient preference. Then, you have your prepackaged meat/cheese/veggie type foods. I’m not being precious here, but no thanks. And finally . . . it taste great. What is this magical elixir? I think you know . 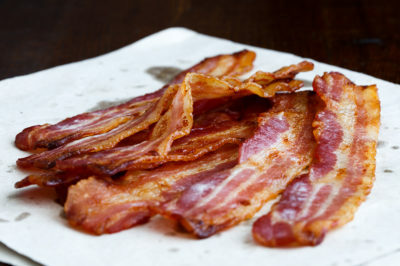 . .
Bacon is so amazing that Jim Gaffigan easily does 20 minutes onstage, exclusively with bacon jokes. It’s that good. There is reason to believe that those nitrates might actually be beneficial to your health. Lay them on paper towels and pat dry with another paper towel (getting rid of the grease has lots of travel and health benefits). Lay them on a few fresh paper towels and then wrap them up in aluminum foil. Half-way through my multi-hour flight, when the person next to me is eating a rubber chicken, microwaved by the flight attendant. I pull out my aluminum foil, open it enough to fill the whole plane with the sweetest aroma known to man, and then I painstakingly, slowly, break off a thumb sized piece and slowly put it in my mouth. If the person sitting next to me can show the honest vulnerability to cry a little, while she stares at me with envy, I usually share—at least a little. If you would like to join me in making the skyways of the world a more bacon rich (and therefore better) place, I have got a deal for you. Bacon truly is my go-to travel food, and I hope you’ll try it on your next travel day. Any of you that have followed me for the past 8 years or so know that I don’t promote any food products or meal replacements. Until now!! I am so impressed with Butcher Box that I will be promoting their product exclusively. I want everyone to enjoy the incredible quality of their meats, at their incredible prices. 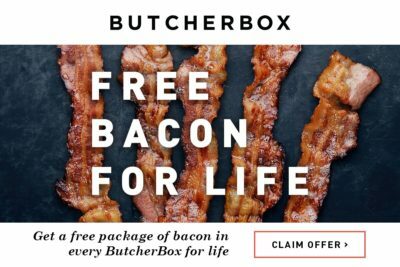 Plus, if you sign up in the next few weeks, you can get FREE BACON for the life of your subscription with Butcher Box. Yes! You read correctly: FREE BACON. You might even be screaming this out loud at this point, in which case you’ve heard correctly: FREE BACON. If I ever make it as far as the pearly gates, and they ask me what I have done for my fellow humans, I can say: FREE BACON FOR LIFE. 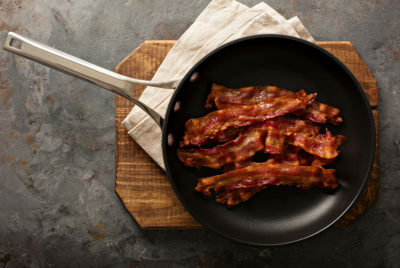 ButcherBox bacon is uncured, free of sugar and nitrates, paleo friendly and non-GMO verified. When you order today they’ll send you free bacon in every box you receive forever! If you haven’t heard, ButcherBox delivers 100% grass-fed and grass-finished beef, free range organic chicken, and heritage breed pork directly to your door, and shipping is always free.